The theme of the Conference is Celebrating Race Amity in the Legal Arena. Race relations in America will not substantially improve unless the public discourse on race moves beyond the blame/grievance framework to one that recognizes and celebrates our ability to overcome racial prejudice through association, amity, and collaboration. While the tradition of racial oppression was unfolding, a parallel tradition, largely hidden and poorly understood, was demonstrating some of the most positive qualities to be found in American history. This, “The Other Tradition”, of close collaboration, amity, and love has served as the moral and spiritual counterweight to the dominant tradition of racism that occupies so much of our national history. The Other Tradition offers a new entry point for the public discourse on race. Race Amity is the mission of our actions and object of our work at the National Center for Race Amity. The National Race Amity Conference offers participants positive, focused opportunities for intimate discussion circles, interactive panels, and informative sessions on a variety of topics central to the main theme of race amity in the United States. The National Race Amity Conference is organized around presentations in the arts, business, community service, education, entertainment, government, media communications, law, spirituality, and sports. Unlike large scale national conferences where “small” breakout sessions can number 75 participants or more, Race Amity breakout sessions usually involved 20 to 35 participants. This smaller group approach offers learning opportunities in group settings that are more conducive to greater sharing and understanding. The conference offers a very good cost value as all meals are included in registration. NCRA strongly encourages you to take advantage of even lower cost through Early Bird registration. 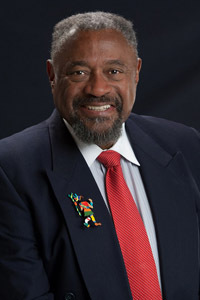 William H. Smith, is the founding executive director of the National Center for Race Amity based at Wheelock College in Boston, Ma. A native of South Carolina, Smith’s initial college career began in integrating division one football in the old Confederate South at Wake Forest College. He was profiled in the Sports Illustrated cover story (November 7, 2005) as one of the pioneers who changed the face of college football. He left Wake Forest to work as a community organizer in the Civil Rights Movement and was drafted into the US Army. He graduated with honors from the University of Massachusetts at Amherst after serving as a medic in Vietnam, where he was awarded two Bronze Star stars and the Combat Medic Badge. He also earned his doctorate in education from the University of Massachusetts, Amherst. Smith has addressed issues of race and diversity in his work with civic, philanthropic and religious organizations including the Phelps Stokes Fund where he served as a trustee and secretary of the Board of Directors, the Regional Baha’i Council for the Northeast States on which he served for ten years, as the Media Advisor to the National Association for Black Veterans (NABVETS), and the Board of Directors of the Africa Media Image Project. In 2000 he organized the historic Joint Congressional Resolution establishing a National Day of Honor to recognize the service of African American and other minority soldiers in World War II. In conjunction with that event, he wrote and produced an award winning documentary film, “The Invisible Soldiers: Unheard Voices,” which aired on PBS. Under Smith’s direction the National Center for Race Amity organized the Middle School Race Amity Theater Project which uses theater to teach moral reasoning skills to middle and high school students. Currently the National Center for Race Amity, through its initiative Towards E Pluribus Unum oversees the annual Metro Boston Race Amity Celebration on the Rose Kennedy Greenway which is in its fourth year, coordinates the lobbying effort to establish National Race Amity Day through a resolution of Congress, and hosts the annual National Race Amity Conference and Race Amity Medal of Honor Awards. Dr Smith is serving as executive producer of the documentary, An American Story: Race Amity and the Other Tradition, currently in production for public television. Dr. Smith has received awards from numerous organizations including the International Academy of Communications Arts and Sciences, the National Association for Black Veterans, Black Filmmakers Hall of Fame, the Screen Actors Guild, and the National Education Association. If you have any questions, please contact Sharon McManus at smcmanus@necc.mass.edu or x3960.